WHY STUDY A DIPLOMA IN CHRISTIAN COUNSELING? Diploma in Christian Counseling (DCC) gives you an in depth study of models and theories of counseling practice integrated with biblical principles for effective applications. The program will equip you with theoretical knowledge, how to apply practical counseling skills, how to be the most effective pastor or counselor you can be and how to provide helpful outreach to your church and community. WHO QUALIFIES TO ENROLL IN THIS CERTIFICATE PROGRAMME? 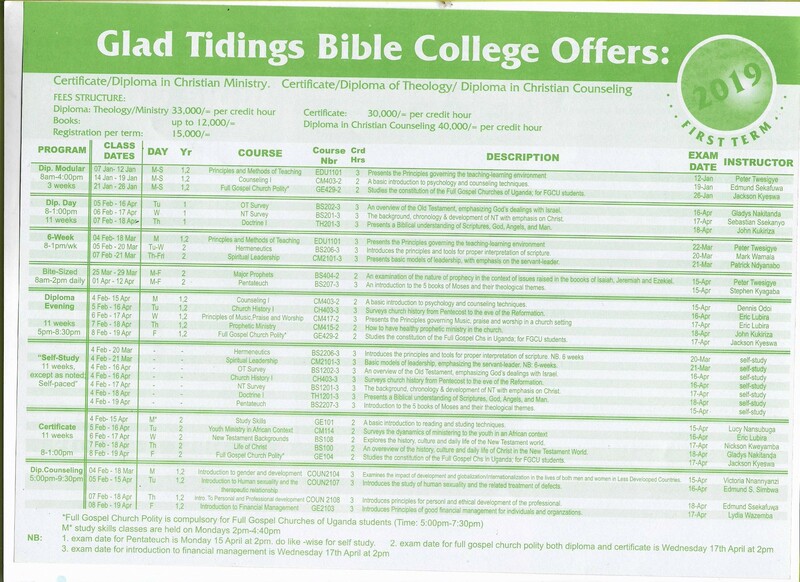 The minimum entry requirement for admission to the ordinary diploma program in Christian counseling (DCC) is a Uganda Certificate of Education (UCE) with at least 5 passes obtained at the same sitting or Uganda Advanced Certificate of Education (UACE) with 1 principle pass and 2 subsidiary passes obtained at the same sitting or its equivalent. For eligible students aged 25 and above, mature age examinations will be taken from an accredited center. Those who pass mature age entry examinations with 50% and above will be considered. A student must have obtained a Certificate in Counseling, Psychology or other related field from a recognized institution whose entry requirements are in line with NCHE standards. Full-time students study in the morning (8am-1pm), afternoon (2-5/5:30pm) and some evenings (5:00pm- 8:00pm) depending on the courses being offered. Evening School Courses are taught from 5:00pm-8:30pm during working week nights. Students can do one course or may attend a different course each night of the week and end up doing 5 courses. The total number of weeks for the term for evening students may vary from 12 weeks to 16 weeks. Each term shall last have at least ten (10) weeks of teaching after which, an appropriate time of at least two weeks shall be allocated to revision and final examinations. The program duration is two years (six terms). Obtain the necessary application forms directly by visiting GTBC at minimum cost of 10,000shs, download them directly from our website or write and request them from the address below.